As an entrepreneur, you may have an excellent business idea that you want to explore, or you may want to expand your already established business. There is just one problem that plagues nearly all entrepreneurs: lack of funding. Sure, it’s a big issue, but don’t let it stop you from achieving your small business goals. If you are serious about starting or expanding your business, there are options for you. Besides receiving funds from a bank loan or online lender, you can open up a business line of credit. Let’s look at what a business line of credit is, how it works, and how you can qualify for it. A business line of credit is a flexible debt product that allows you to access a fixed amount of capital, and use it to meet short-term business needs. It’s kind of like how a credit card works. For instance, you can borrow up to $100,000 and pay interest only on the portion of money that you actually borrow. You can then draw and repay funds as you like, as long as you don’t exceed your credit limit. You can use a business line of credit to finance working capital requirements, such as marketing campaigns, inventory purchases, or even to manage your business’ cash flow. Now let’s take a look at how a business line of credit works. It’s fairly simple. 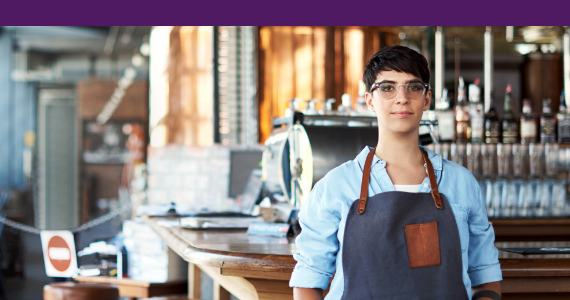 Once you open up a business line of credit, your business receives a fixed amount of funds. You then receive a monthly statement that reflects the amount of credit you have used, plus interest charges. Once repaid, the credit limit becomes available to access again as needed. Besides interest charges, there is also an annual fee, and transaction fees if your business frequently uses the line of credit. You have a seasonal business (an ice cream shop, let’s say) where it generates most of its sales during summer time. Receiving a business line of credit for offseason times is a good idea. It can be of use to cover overhead costs and allows your business to maintain its normal business operations, even when your income fluctuates. You want to run a marketing campaign for your small business. A business line of credit provides finance for your marketing tactics, which would attract new customers and increase sales. Since the campaign will potentially generate good revenue, the borrowed funds could be paid off quickly. The qualification requirements are different for each lending institution, but most lenders will want to see your financial records and documents that demonstrate your creditworthiness. This also includes reviewing your assets and your overall revenue. Banks and some credit unions require additional documents that online lenders do not require. Be sure to have a good business credit score. Many online lenders have a simpler qualification process than traditional lenders, like banks. So before applying for a business line of credit, it’s best to discuss the details of your business’ financial position with your prospective lender. You should also consider consulting an advisor regarding any documents that you may be unfamiliar with to fully understand what the documents suggest about the financial health of your small business. Lastly, if you want to get a better sense of your creditworthiness and monitor your business credit on the regular, start with Get Loop today!